In 2007, one of those wonderfully simple experiments was done. The dimethyl lithium cuprate reagent (dissolved in THF) was injected into an NMR sample tube at -100°C containing A, and the spectrum measured immediately. The species identified as 4 (the numbering as used in the reference) has two 1H methyl resonances at ~ -0.04 to – 0.23 ppm (assigned to Meβ) and -1.08 to -1.11ppm (assigned to Meα), and the copper coordinates to the alkene as a π-complex. 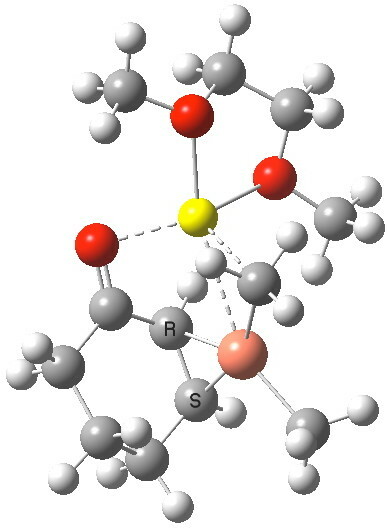 If TMS cyanide is added, 4 is immediately converted to complex 1, in which the π-complex is replaced by a simple C-Cu σ-bond. Compound 4 upon heating gives B, whilst 1 gives the silyl enol ether of B. How does this match quantum simulation? First, the 1H NMR result for 4 (at the wB97XD/6-31G(d,p)/SCRF=THF level and with the lithium coordinated to an ether solvent) comes out as -1.4 ppm (Meα) and -0.31 ppm (Meβ). The 13C is 76.4 and 60.6 ppm for the vinyl carbons (positions 3 and 4, obs) and 64.5/56.7 (calc). These latter values are affected by spin-orbital coupling to the metal, which can shift the values by up to about 10 ppm, but the relative values are also in good agreement. So the reaction must proceed starting from this π-copper complex. The IRC reveals a concerted transfer of Meβ to the conjugate 4-position of B, with a reasonable barrier to reaction which indicates that on warming to room temperatures, the complex 4 will readily react. Formally at least, this corresponds to reductive elimination from the Cu(III) species to form a Cu(I) complex (in which however the metal now coordinates to the enol double bond rather than the alkene). IRC for methyl transfer. Click for 3D transition state. I will deal with the case of methyl transfer from 1 in a later post. With 4, we can directly see that the origins of conjugate 1,4-addition an α,β-unsaturated ketone are that the Cu reagent forms a π-complex to the alkene, which positions one of the alkyl groups on the metal in the ideal position to attack in conjugate manner. Regarding the different behaviour of the magnesium Grignard reagent, it boils down to asking why it does NOT form a π-complex in this situation (I would note here that Mg-π-complexes are indeed known). This entry was posted on Sunday, November 4th, 2012 at 6:48 pm and is filed under Uncategorized. You can follow any responses to this entry through the RSS 2.0 feed. You can leave a response, or trackback from your own site. Secrets revealed for conjugate addition to cyclohexenone using a Cu-alkyl reagent. is licensed by Henry Rzepa under a Creative Commons Attribution-Noncommercial-Share Alike 3.0 United States License.